Spray cold grate of gas grill with grilling spray. Preheat grill for medium heat. Grill corn 10 minutes or until lightly charred, turning occasionally. Grill franks 5 to 7 minutes or until hot, turning occasionally. Remove from grill; keep franks warm. Place avocado in small bowl; mash with fork until smooth. Stir in mayonnaise and 1 tablespoon lime juice; set aside. Cut corn kernels off cobs. Stir together corn, tomatoes, onion, jalapeno, remaining 1 tablespoon lime juice, salt and pepper in medium bowl. 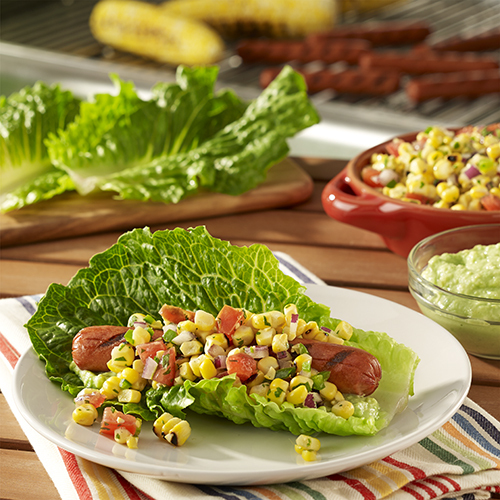 Spread each lettuce leaf with avocado mayonnaise; top each with a frank and about 1/3 cup corn salsa. Serve immediately.